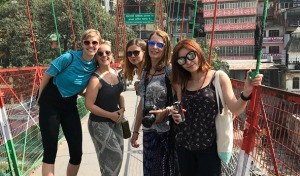 Rishikesh Yoga Retreats offers you the opportunity to learn yoga traditions in India during our long-term programs and tours, with options to dive into ancient knowledge during the short-term retreats. In order to join the weekend or week-long yoga retreats, participants must be medical students or 200-hour certified yoga practitioners (from an accredited yoga school). During these programs, you will journey into the depths of your yoga practice. Located in Rishikesh, the yoga capital of the world, on the banks of the holy Ganges River, Rishikesh Yoga Retreats offers a natural haven for those who seek to experience an environment to evolve the body, mind and spirit. Rishikesh Yoga Retreats is known for teaching traditional Hatha and Ashtanga systems of yoga, relying upon the sage wisdom of Patanjali as set forth in Patanjali’s Yoga Sutras. 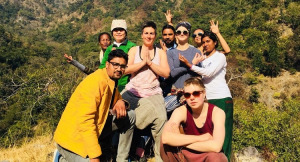 Rishikesh Yoga Retreats is dedicated to sharing and spreading the knowledge of this timeless lineage, and inspiring yoga practitioners from all over the world. Our objective is to deliver an authentic Hatha and Ashtanga yoga experience to our students through our training programs and retreats. Students in our yoga teacher training programs experience transformations as they evolve their own practice and arrive at a deeper understanding of articulating postures and theory to others as their courses culminate in teaching theory and practice to their fellow student teachers and drop-in students. Our comprehensive training courses are conducted by highly experienced and dedicated yoga practitioners who seek to infuse real traits of the yogic lifestyle in those who come to practice and study Hatha and Asthanga Yoga at Rishikesh Yoga Retreats. We believe in sharing the Hatha and Asthanga Yoga system in a way that brings balance between the bodies, minds and souls of our students so that they may bring more happiness, stability, and peace into their lives.